Shows and hides invisible files via repeating dialog box. Is there a better alternative to iShow Invisible? Is iShow Invisible really the best app in System category? Will iShow Invisible work good on macOS 10.13.4? 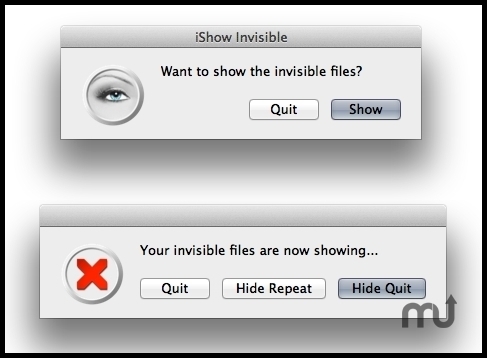 iShow Invisible shows and hides the invisible files via a repeating dialog box. After you have revealed the invisible files, simply move the Hide dialog box out of your way or press Command-H to send it to the background. Any open folders should remain open when you change the visibility. This makes it easier if you have several folders open and want to view the invisible files. iShow Invisible needs a rating. Be the first to rate this app and get the discussion started!